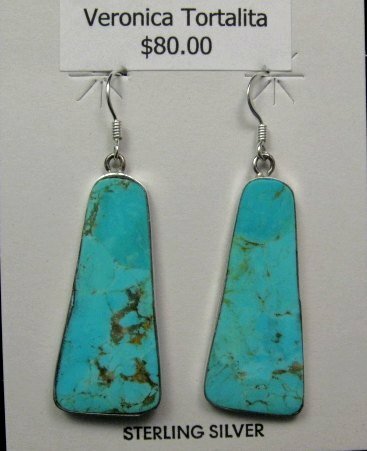 These lovely contemporary Santo Domingo earrings feature stabilized turquoise stones encased in sterling silver. Handmade by Veronica Tortalita. 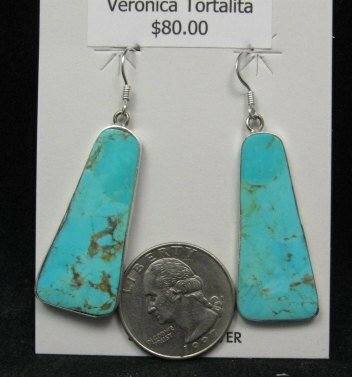 The earrings measures 1-5/8 inch long by 5/8 inch wide. Brand new and in perfect condition. Certificate of Authenticity and gift box included with your purchase. Veronica Tortalita specializes in mosaic inlay work on shell. She makes both earrings and pendants.